One Momma Saving Money: Beatuiful birthstone bracelets only $7.99 each! Beatuiful birthstone bracelets only $7.99 each! These adorable nest charm bracelets are completely personalized to your family! Choose up to 5 pearls as representatives of your children or grandchildren. Each nest charm slides along a bangle bracelet and is accented by a leaf charm to complete the look. 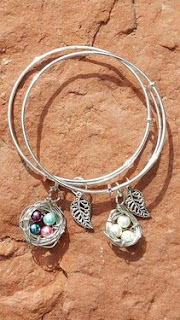 Customize this bracelet to match all the chickadees in your nest! 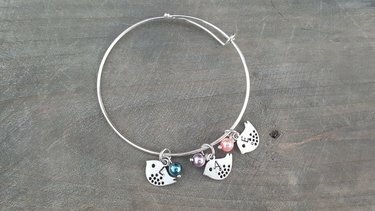 These bracelets come with up to 8 baby bird charms with 8 birthstone pearls. Each bird is also stamped with the initial of your choice.